While exploring the unique and diverse land we call home, remember that it's everyone's responsibility to ensure the preservation of natural areas for future generations. Keep in mind that while the outdoors does offer excellent entertainment and recreation, it is also home to vibrant and complex communities of plants, animals and insects. Be sure to respect these outdoor communities, and ensure your own well being by following the 7 Leave No Trace principles . The Potrillo Mountains Complex of the Organ Mountains - Desert Peaks National Monument is located approximately 30 miles southwest of Las Cruces and 40 miles northwest of El Paso, The west potrillo Mountains area are the prominent landform of the region, which is one of the largest relatively undisturbed stretches of chihuahuan desert in New Mexico. The Landscape is a broad volcanic field encompassing hundreds of cinder cones, large craters, and the shield volcano of Aden crater the produced extensive lava flows over 10,000 years ago. This lava flow contains pressure ridges, lava tubes, and crevices up to 5 feet wide and 20 to 30 feet deep. These features evoke a primeval, “moonscape” image for visitors. This region receives little visitor use, making it an excellent destination to explore if one desires solitude. There are no developed recreation sites or designated trails, making for rugged travel for hikers. Check out New Mexico’s largest volcanic steam crater on this hike along the rim of Kilbourne Hole. The crater was created sometime between 24,000 and 100,000 years ago when molten rock came into contact with subsurface water and caused a series of massive explosions. This interaction turned the groundwater into superheated steam that blew more than 500 million cubic yards of volcanic ash, rock and alluvium over a 20 to 30 square mile radius. Because of Kilbourne hole’s unique geology, it was designated a national Natural Monument in 1975. Though there is not much elevation gain on this trek, the loose, deep sand around the edge of the crater can make this hike somewhat arduous. Visitors please note that most of the bottom of the hole is private property; permission to enter should be obtained from the owner. Hiking Directions: The route goes around the entire crater, essentially following the contours of the rim. The Florida Mountains are located in Luna County approximately 12 miles southeast of Deming. This range is characterized by spectacular jagged spires and multi-colored cliffs of Precambrian granite, overlain in places by Ordovician limestone. They form the scenic backdrop to Deming and are part of an important viewshed for people who live here and those traveling along I-10 and NM Highway 11. These rugged mountains rise over 2,800 feet above the surrounding desert to an elevation of 7,448 feet at Florida Peak, and dominate the landscape for miles around. This mountain range is truly a sky island, and a diversity of habitats is found here because of the variations in elevation, exposure, and soil types. Coniferous woodland (pinyon-juniper), mountain scrub (or chaparral), grasslands, desert scrub, and cactus plant communities comprise much of the vegetation. Small pockets of riparian areas are found around the several springs in the area. Rare or unique species that occur, or may occur in the area include the night-blooming cereus, Orcutt’s pincushion cactus, Sneed’s pincushion cactus, and the State-listed Florida Mountains oreohelix (mountain snail). Bird species of note include golden eagles, prairie falcons, great-horned owls, hawks, ladder-backed woodpeckers, canyon wrens, and black-chinned sparrows. This range is also home to mountain lion, bobcat, mule deer, javelina, and numerous other mammals. See scenic rock formations and cliffs, including a mushroom-shaped hoodoo on this secluded route through the Florida Mountains. Though not described here, one can hike to Florida Peak (the highest point in the range) from Windmill Canyon. Hiking Directions: Although a four-wheel drive vehicle can make it up the rough track from the starting point into Windmill Canyon, you can probably walk along it faster than you can drive. Hike southwest along the jeep trail for about a mile into Windmill Canyon. At the end of the jeep trail, you will see an old livestock tank and defunct well. This old well is probably how Windmill Canyon got its name. From here, you can continue southwest up the canyon on a faint, primitive foot trail. This route can be difficult to follow, but is useful in getting through the dense oaks and other shrubby vegetation in the canyon. From the old livestock tank, cross the drainage to the west, then follow along the embankment of the dry streambed to the southwest, staying on the northwest side of the canyon. In about a half-mile mile, the faint trail crosses the drainage; and in another quarter-mile, it crosses it again. At this point, a scenic, rocky side canyon comes in from the west. This makes a good stopping point to sit and enjoy the scenery. Hike back the same way. Although it is possible to hike to Florida Peak from here, be warned that it is a strenuous, off-trail hike on very steep, rocky slopes. The Black Range (historically called Sierra Diablo – Devil Mountains) is a rugged, north-south trending mountain chain located approximately 35 miles west of Truth or Consequences. The southern part of the range is also called the Mimbres Mountains, but is considered part of the Black Range. At over 70 miles in length, it is one of the longest mountain ranges in New Mexico, running from Cooke’s Range in the south to the Plains of San Agustin in the north. From a base elevation of about 5,500 feet, several peaks in the range rise to over 10,000 feet. McKnight Mountain, elevation 10,165 feet, is the tallest, located in the central part of the range. The Continental Divide runs along the top of the mountains in the northern part of the range. Warning: Recent fires in the Black Range have dramatically changed the ecosystem here. They also effect hiking opportunities. Dead and falling trees not only present a hazard to hikers, they block trails and make areas more difficult to traverse. The thick growth of oaks, aspens and other vegetation that sprout after a fire in some areas can rapidly obscure trails, making navigation difficult. Flash flooding also increases after fires. Take the necessary precautions in burned areas. This is a great mountain hike in summer, when the desert is sizzling with heat. It is also a great introduction to the Aldo Leopold Wilderness. It is a fairly difficult trek along the Crest Trail #79, but it can be made easier by not going all the way to the peak. There are several viewpoints along the ridge before the peak that make great destinations for a picnic. There are also good campsites for an overnight backpack. Spring and summer wildflowers can be fantastic along the trail, given good moisture conditions. The northern-most section of trail near the peak is also good for aspen viewing in the fall. Snow hangs onto the northern slopes late into spring in this area, and late summer thunderstorms can be fierce. Hiking Directions: This hike is along one of the few well-used trails in the Black Range and is easy to follow. From the trailhead, the trail traverses the steep, forested slope for a short distance to the northwest before it intersects the road that goes up to the heliport at Emory Pass. Go right (north) on this road and pass the heliport on the left, then pass through a fence line. Next, the trail heads to the northeast and after a couple of switchbacks, reaches the ridge and a great viewpoint around some large outcroppings. From this point, the trail heads back into the forest to the northwest, staying on the west side of the divide for about a mile before crossing back over to the east side of the divide, and eventually crossing the Aldo Leopold Wilderness boundary, about 2 miles from the starting point of the hike. At this point, the trail traverses the eastern slope of Cross O Mountain, and in a little more than a half-mile reaches a saddle on the ridge with another great view to the east. This makes a great destination for those not wanting to climb the peak. From this saddle, the trail continues north around the west side of an unnamed peak before reaching a narrow ridge in a little over a half-mile with great views back to the southwest. Along this ridge are the junction of Trail 412, the Hillsboro Peak Bypass, and the junction of trail 127, the Percha Creek Trail. Trail 412 heads west traversing the slope below the peak and rejoins the crest trail west of Hillsboro Peak. You can follow this trail to make a loop around, and up to the peak, but the description here continues north, climbing up the ridge, which is the shortest route to the peak itself. From this trail junction, it is a steady climb up several switchbacks to one of the highest peaks in the Black Range. On top, you will find a cabin and fire tower, and a nice meadow with great views. *Note: the Lake Valley Backcountry Byway makes a great alternate route home from your day in the Black Range. From Hillsboro, the Byway heads south on NM Highway 27, passing by the ghost town of Lake Valley in route to Nutt and the junction of NM Highway 26 several miles west of Hatch. The Caballo Mountains in south-central Sierra County were named for the wild horses that once roamed the area. They are a narrow, north-south trending range located south of Truth or Consequences (T or C) adjacent to the Rio Grande. From T or C, they run for almost 30 miles south and terminate north of Hatch where the Rio Grande makes a major turn to the east. These mountains tower 2,500 feet in elevation above the river in the northern part of the range. Timber Mountain, the highest peak at 7,565 feet in elevation, can be recognized by the radio and television towers on its summit. Hike the crest of the Caballo Mountains and enjoy incredible views of the Jornada del Muerto to the east and the Rio Grande Valley to the west. This view is particularly striking at sunset when the sun disappears behind the Black Range, which forms the scenic skyline on the west. This hike follows a jeep trail between Timber and Brushy Mountains along the highest ridge of the Caballo Mountains. (Note: this hike is much more difficult if you chose to park at the bottom of Timber Mountain – see driving directions below). 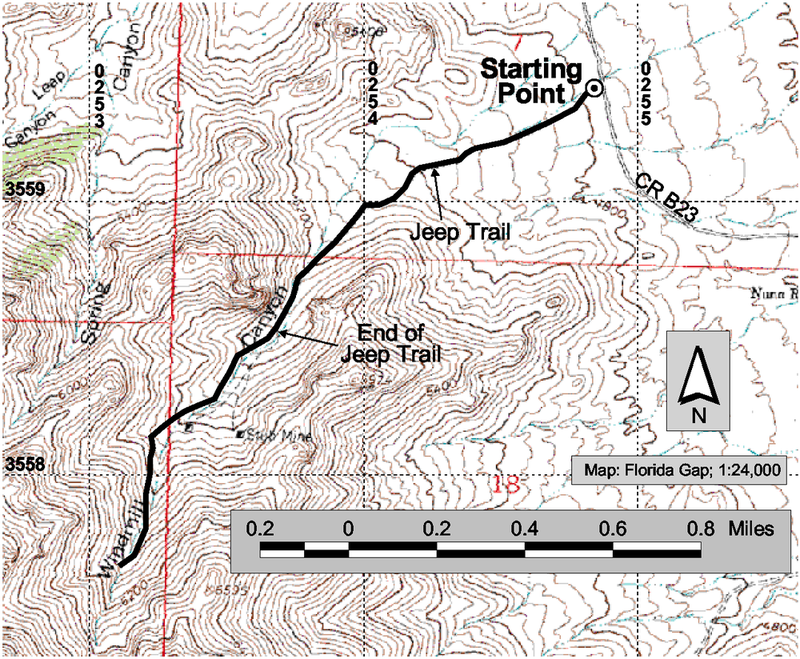 Hiking Directions: From the starting point, follow the jeep trail as it descends from Timber Mountain to the narrow ridge to the southeast. In about a mile, the terrain levels out as you continue to follow the jeep trail to the south along the ridge. With the pinyon-juniper woodland and incredible views, the primitive campsites found along this ridge tempt one to make this an overnight camping trip. About 2 miles south from the starting point, the jeep trail begins to climb up toward Brushy Mountain, still a little over a mile to the south. As you begin the climb, ignore the jeep trail that intersects from the east and the jeep trails that intersect from the west before you get to Brushy Mountain. Stay on the main ridge, trending in a southwesterly direction. Eventually the jeep trail skirts the east side of Brushy Mountains and ends at a cliff with an incredible view on the southeast side of Brushy Mountain. From here, you can hike west along this cliff to a high viewpoint about a quarter-mile west of Brushy Mountain. Return via the same route. Towering above the Mesilla Valley, the Organ Mountains (first named Las Sierras de Soledad by early Spanish explorers) are the dominant landform on the eastern skyline of Las Cruces. Lying 12 miles east of Las Cruces, this north-south trending range is 17 miles long and 8 miles wide. The Organ Mountains encompass extremely rugged terrain with a multitude of steep-sided crevices, canyons, and spires. From a base elevation of 4,500 feet, the mountains rise dramatically in a short distance to 9,012 feet at Organ Needle, making this one of the steepest mountain ranges in the western United States. There are additional hiking opportunities in a triangle of land on Fort Bliss between Dripping Springs and Aguirre Springs. This land could possibly be transferred from the Department of Defense to the BLM. If you would like to see this happen, please contact your members of congress. This hike follows an undesignated trail from Aguirre Springs Campground that is very steep in places and can be difficult to follow. Along this hike you get fabulous views of Sugarloaf Peak and the Needles. It is also a good place for birding since water can often be found in the canyon. Fees: $5.00 day-use fee to enter Aguirre Springs Campground; $7.00/night to camp. Hiking Directions: From your vehicle, hike south behind the group shelter near the southeast corner of the parking lot. The beginning of the route is not signed and can be a little difficult to find. From the shelter, climb up the hill to the south. You should find one of several faint paths leading a short distance to a fence. Look for the turn stile in the fence, go through on a well worn path, and in about 50 feet, turn to the left for a sharp drop into the drainage. This route is also well worn, but not marked, so look carefully for this first turn. Cross the arroyo, and make a short hike to a rock face. Here you can either climb toward the trees at the top, or walk across at about the same elevation. In either case you will find a generally well-worn path, occasionally marked by cairns, which climbs to the south for the next two miles. As you approach the base of Sugarloaf, the route splits. There is a sign marking the left path to Sugarloaf (a technical climb), with the right path dropping down into the drainage to the right. There is a small saddle just to the northwest of this drainage that makes a good stopping point with incredible views all around.